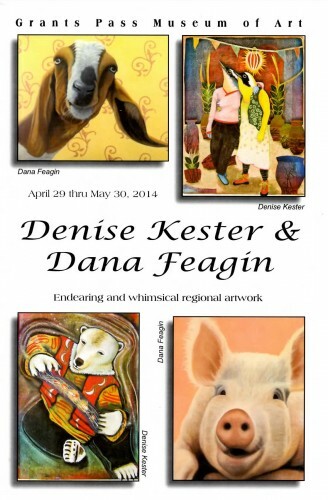 June 1 – 30, Ashland Art Center Featured Artist – Pig Tales, A Celebration of Pigs Through Paintings and Poetry to Benefit Sanctuary One Rescue Pigs. Ashland Art Center – 357 East Main Street, Ashland, OR (541) 482-277. Open 10AM – 6PM Every Day. Original paintings, prints and cards are featured in this downtown gallery & community art center. Sanctuary One – 13195 Upper Applegate Road, Jacksonville, OR (541) 899- 8627. 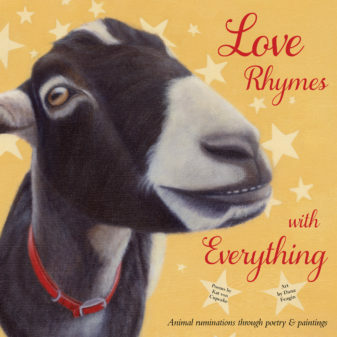 Cards and magnets are available for sale in the Sanctuary One gift shop, as is the book, Love Rhymes with Everything. Small framed prints are available for purchase at Land of Paws. 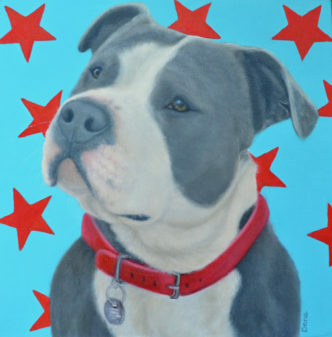 DiDi is also my dogs’ groomer, and an original painting of her Boxer, Spike, is also hanging at this location. Dana’s Open Studio Weekend – part of the Ashland Open Studio Tour & a Benefit for Sanctuary One – October 7 & 8. 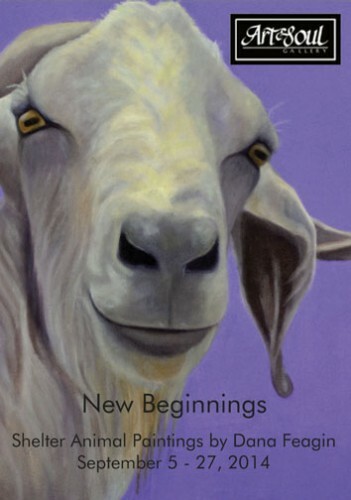 “The Funny Farm”, Whimsical Animal Paintings by Dana Feagin, Art & Soul Gallery, 247 East Main Street, Ashland – August 4 – 30th – 10% of sales benefit Sanctuary One, a non-profit care farm in Jacksonville, OR. Artists for Equamore, May 31st, 3-6PM, 4723 HWY 66, Ashland. 20% of proceeds benefit Equamore Horse Sanctuary in Ashland. Chung King Studio, 975 Chung King Road, Los Angeles, CA (March 27-29, 2015) and Wilding Cran Gallery, 939 South Santa Fe Ave, Los Angeles, CA (April 4 – 18th, 2015) – BUNNYMANIA – A Curated Group Show and Benefit for the National Museum of Animals and Society.